L: 54" x W: 20" x H: 38"
Soleste Server w/ Wine Storage If your home is a frequent gathering spot for family and friends, you’ll love the beauty and convenience of this Soleste server with wine storage. Its eye-catching design puts a sophisticated spin on casual style with a honey finish and a gorgeous patterned top. Plus, you’ll love the fuss-free distressing, which adds a hint of rustic charm. If your home is a frequent gathering spot for family and friends, you’ll love the beauty and convenience of this Soleste server with wine storage. Its eye-catching design puts a sophisticated spin on casual style with a honey finish and a gorgeous patterned top. Plus, you’ll love the fuss-free distressing, which adds a hint of rustic charm. My husband and I ordered this as part of our new dining room set when we bought our home. The server is beautiful, providing storage space for serving platters, silver, wine glasses and place settings. It works great as a bar during parties and cleans up beautifully. We haven't fully stocked the wine rack yet, but love the classic, country look of the set. Very attractive and matches so well with the dining table and chairs! I can't wait to fill it with bottles of wine and entertain! It is a very nice addition to my dinning room. I recommend this product. Purchased this a couple weeks ago from my local store with the seven price dining room that matches. This looks beautiful and well made. I would highly recommend to anyone. The doors glide with ease and there is nice storage for wine and other accessories. Beautiful peice! We purchased the server a few months after the matching dining table and we’re so glad we did. The additional piece really enhances the beauty of the set. It’s the perfect size and doesn’t overtake the room. The sliding doors adds a modern element over doors that swing out - also great for narrow spaces. Would highly recommend this product. This is a fantastic looking server that matches the dining room set perfectly. Having an area to put your bottles of wine right beside the table is a great feature. If you don't want to use it for that you can take the cross pieces right out. We like the way the side panels roll across instead of opening like doors. The shelves at the bottom open easily and provide plenty of storage space. The server is well made and looks like you would expect a nice piece of furniture to look. Everything about it looks great. The adjustable legs allow you to stabilize it on any floor. We are expecting it to provide years of service. The rich colors and design give this server that elegant look. It complimented my existing furniture. Lots of storage room as well as the display cabinets. The sliding glass doors is a nice addition. We are very pleased with the Server. It was very helpful that the wine bottle section was easily removable. We had some trouble getting the feet out of the middle drawer - but ultimately solved it by cutting into the box and removing the feet one at a time, then taking out the empty box. This was not in the instructions. Also absent from the instructions was the location of the screws for the feet and the holders for the glass shelves - but we eventually found them. After overcoming these difficulties we are very happy with the product. Beautiful server, solid wood with a nice design. We assembled it ourselves with little effort. love this it holds all my wines and alcohol bottles and all my shot glasses and the wine glasses. the draws are very helpful for storage. I would Recommend this to anyone and everyone that visit my house loves this piece. The Soleste dining buffet is gorgeous! It matches our Soleste dining table perfectly and the cherry wood is rich in color and obvious high quality. It was delivered so quickly and professionally. Very pleased and highly recommend! 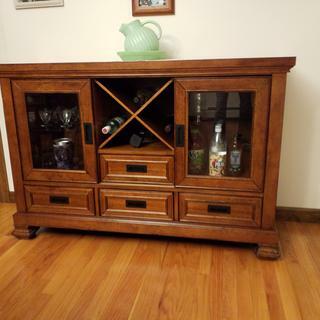 This is a beautiful wine server cabinet that goes well with my home decor, including my bamboo wood floors. 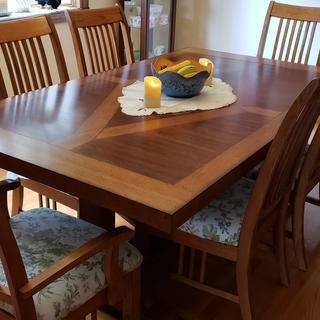 I also purchased the 7 piece dining room set. Very sturdy and well built. Love the furniture...excellent choice for us! We love the new table and server. It fits perfectly in our dining room and decor. Would highly recommend these pieces as the quality is top notch! Very happy this choice. Goes great with our dining set. Delivery was fantastic. Perfect addition to finish off my dinning room. perfect fit as well as great storage for China and silver service. sets off the dinning room for a more formal dinner. The wine storage rack is perfect to store the bottles until your ready to use them for a dinner party, and the sliding end doors work nice instead of the traditional opening doors. This is a gorgeous piece. The inlaid design on the top is unique and one of a kind. Very well made. Quality!! What are the dimensions of the legs? Could I use bed risers to elevate the unit? BEST ANSWER: Hello Ruthie, thank you for your interest in the Soleste Server with wine storage! We do not recommend adding bed risers underneath this server. Are you able to adjust the height of the shelves? BEST ANSWER: Yes. The shelves are adjustable. How many wine bottles can you fit in the center x section? BEST ANSWER: The center X section of the Soleste Server will hold 12 standard wine size bottles. BEST ANSWER: This collection is made by Bellanest, our Raymour & Flanigan exclusive brand. As we will be using this as a tv cabinet, need to know Approx. width of each of the 3 sections to ensue the tv box will fit into space? BEST ANSWER: The space behind the doors measures 15" W X 15" D. The drawers are all 4" deep.